A series of day trips within Rockland County focusing on historic houses of worship, cemeteries, and other points of interest. 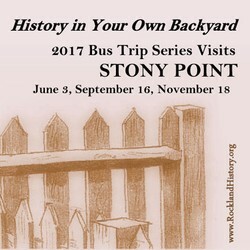 The fifth year in this series begins in June and will take place in the historic Town of Stony Point. It has been made possible in part by generous contributions from the Town of Stony Point and St. John the Divine Episcopal Church. All trips include bus transportation, tours, and lunch at a local venue.